The inside/outside approach refers to an incredibly expensive water control system. The system involves a limited outdoor system such as exploration trenches rather than full outdoor work. Partial work has absolutely no benefits to the homeowner. Instead, it benefits the salesman. They can sell potential customers on all the benefits of excavation, but the company won’t have to do much digging. An interior dig that doesn’t get lower than your basement floor is useless. Your drain tiles are on your basement floor, so the ground water collects there. This is why any digging that doesn’t reach lower than the basement floor is useless. It also benefits the company by allowing them to charge money for (completely useless) digging as well as the interior drains and pumps that are still necessary. When actual waterproofing is performed, there’s no need for inside work. Control systems need several different devices in order to work. A sump pump is a pump that discharges the water. These will generally be called different things by different companies. You may hear them referred to as a “pressure release system” or something more ridiculous like “super water extractor”. Some unscrupulous salespeople will even claim their system isn’t the same as a sump at all. Regardless of what they call it, a pump underneath the floor is a sump pump. That’s the technical definition. If a company claims to do waterproofing, ask to see a waterproofing permit. Since most municipalities issue separate permits for waterproofing and water control, you can use this to see if they actually do perform waterproofing. 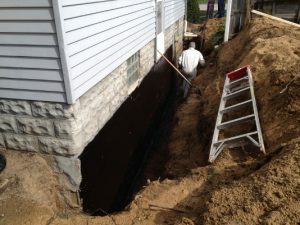 A company shouldn’t claim to offer basement waterproofing when they’re actually performing water control. Expanding clay is another common cause of leaking. You’ll often see wall shearing, which is sometimes referred to as horizontal cracking. Clay expansion is so common that it’s estimated to be the leading cause of home damage. If you notice the walls along your foundation are beginning to crack. If you notice bowing, or if there’s any movement, then you likely have a problem with clay expansion. System companies have come up with a number of different devices to stabilize walls. Not only does it let them avoid digging, it allows them to sell even more devices. Rather than keep the symptom under control, doesn’t it make more sense to fix the problem? Not only will it save you money, but it’s difficult to sell a home that has anchors and beams attached to the inside of your walls. What’s more, a control system may actually make the cracking or bowing worse. The basement floor helps stabilize the bottom of the foundation walls. If there’s a sign of moving walls or horizontal cracking, taking a jackhammer to the concrete (which is necessary to install a control system) can destroy that support. A cracking wall that loses even more support is the opposite of good! Why are there so many companies that install control systems rather than perform actual waterproofing? One word. Profit. Water control systems can be installed with very little equipment. It also takes little in the way of skilled labor, nor are the material costs very high. It’s not uncommon to see companies making a profit of 70% by installing these systems. Gianni DiFranco, the president of DiFranco Contractors Inc, has over 25 years of experience in the basement waterproofing field and general construction. Please visit his blog if you’d like to read more about basement waterproofing and the different types of systems being installed.